President of the United States, 1901 - 1909. 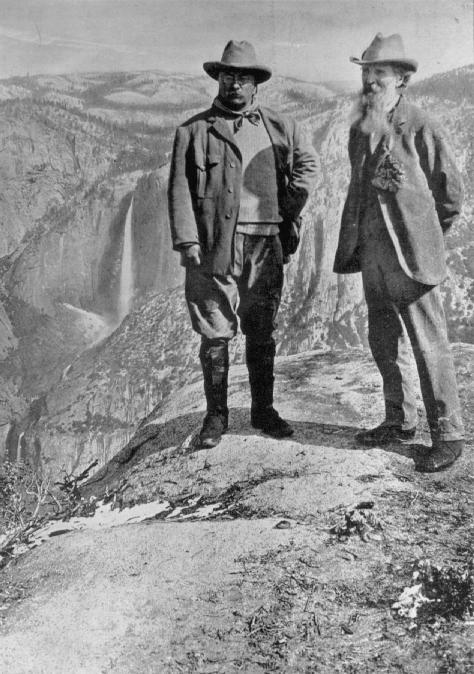 In 1903, Roosevelt visited Muir in Yosemite. 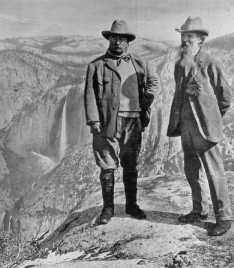 Guided into the Yosemite wilderness by naturalist John Muir, the president went on a three-day wilderness trip that started at the Mariposa Grove, and included Sentinel Dome, Glacier Point, and Yosemite Valley among other points of interest in Yosemite National Park. Muir seized the opportunity "to do some forest good in talking freely around the campfire," and the President, referring to John Muir, is quoted as saying "Of course of all the people in the world, he was the one with whom it was best worth while thus to see the Yosemite." Roosevelt and Muir camped the first night, May 15, at the Mariposa Grove under the Grizzly Giant, with the President bedding down in a pile of about 40 wool blankets, and the second night was spent in the vicinity of Sentinel Dome during a snow storm that left five inches of new snow on top of the existing five feet of snow. The third night of camping was at the edge Bridalveil Meadow in Yosemite Valley, where President Roosevelt was Muir's captive audience to hear a convincing plea for Yosemite wilderness and for setting aside other areas in the United States for park purposes. That night, during the campfire discussion, Muir's main focus of conversation was not only the need for forest preservation but also his concern that the California State Grant of Yosemite Valley and the Mariposa Grove, surrounded in 1892 by Yosemite National Park, be receded to the United States for inclusion in the park. Roosevelt agreed that two controls made for "triple troubles." 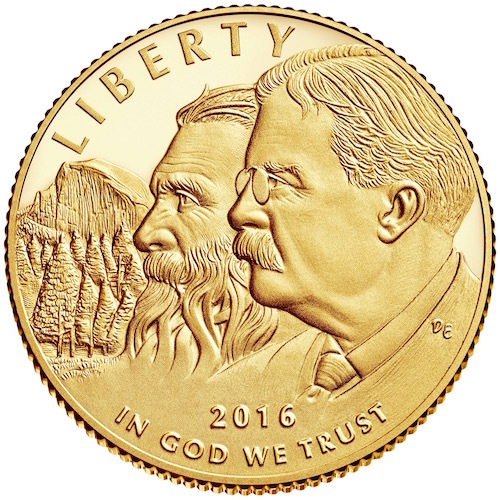 Eventually, their discussion prompted the Presidential signature on the Yosemite Recession Bill in June, 1906. This Joint Resolution accepted the recession by the State of California of the Yosemite Valley Grant and the Mariposa Big Tree Grove, now the Mariposa Grove of Giant Sequoias, which withdrew them from state protection and put them under federal protection, making them part of Yosemite National Park. "There can be nothing in the world more beautiful than the Yosemite, the groves of the giant sequoias...our people should see to it that they are preserved for their children and their Children's children forever, with their majestic beauty all unmarred," said Theodore Roosevelt. During his presidency, Theodore Roosevelt signed into existence five national parks, 18 national monuments, 55 national bird sanctuaries and wildlife refuges, and 150 national forests (Source for forgoing: "100th Anniversary of President Theodore Roosevelt and Naturalist John Muir's Visit at Yosemite National Park" - National Park Service Press Release (May 15, 2003). A tribute to John Muir by Theodore Roosevelt. In this excerpt, and the next entry,. Roosevelt complained that Muir seemed to care little for birds or bird songs, and seemed to be "not interested in the small things of nature unless they were unusually conspicuous." Historian Donald Worster points out that "What he failed to realize was that Muir was mainly a botanist and geologist, not an ornithologist, although by no means indifferent to the smallest of plants or the faintest striations on rock." Indeed, Muir's writings are full of stories about small things, including bees, flies, and even grasshopper tracks. Charlie Leidig's Report of President Roosevelt's Visit to Yosemite in May, 1903 - (PDF) (original typewritten manuscript by Charles Leidig, one of the civilian rangers to accompany Theodore Roosevelt during his 1903 visit. His recollections were recorded and filed in the Yosemite Research Library, which kindly supplied us a copy. A Year of for Yosemite Anniversaries (PDF) (offsite link) - Yosemite Association special issue of its journal Yosemite (Vol. 65., No.2, Spring 2003) - containing illustrated articles about the famous 1903 camping trip by Roosevelt and Muir: "Theodore Roosevelt and John Muir: 100 Years Ago and Today" by Gary Koy, and a reprint of "Charlie Leidig's Report of President Roosevelt's Visit to Yosemite in May , 1903." A Camping Trip with Roosevelt and Muir by Hank Johnston (PDF) (offsite link) - Yosemite Association Vol. 56, No. 3 (Summer, 1994). "We Will Pitch Camp at Briadalveil!" by Ralph H. Anderson (PDF) (offsite link) - Yosemite Nature Notes, May 1951.Article with photos about the famous 1903 camping trip. The Tramp and the Roughrider - A current re-enactment performed by Lee Stetson and Alan Sutterfield. The Wilderness Warrior: Theodore Roosevelt and the Crusade for America by Douglas Brinkley (Harper Perennials, 2010) - covers Roosevelt's positions on conservation. Theodore Roosevelt - American Museum of Natural History (offsite link) - website featuring permanent exhibitions, articles, photos, and videos about Roosevelt.